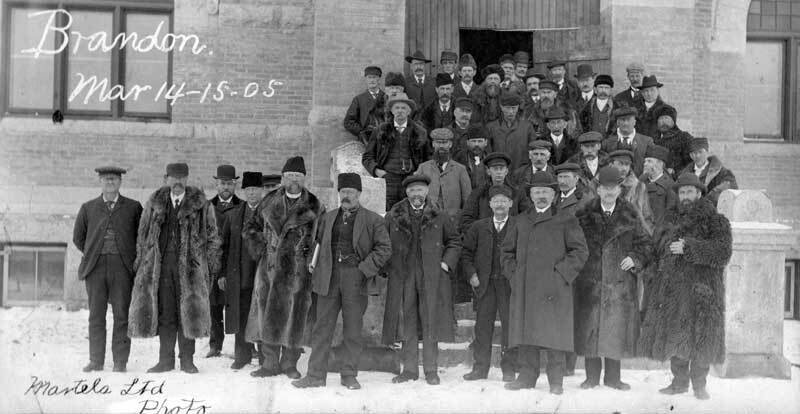 Delegates to the 1905 founding meeting, at Brandon, of the Union of Manitoba Municipalities. On the second day of the meeting, various other resolutions were considered which collectively illustrate the nature of municipal governance issues of the day. Among the resolutions passed was one urging the federal government to compel railway companies to assume all costs of road crossings whenever such were required to maintain public safety. The Union was also understandably concerned about procuring tax revenue for public works. For example, they worried that land which had been set aside throughout the province as an endowment for the University of Manitoba—sale of which would generate revenue for the institution—were not generating tax revenue for their constituent municipality, so a system of grants in lieu of taxes was advocated. The councilors from Macdonald drew the group’s attention to another thorny tax problem. In their municipality, as well as others around the province, large areas of land had been originally assessed as “swampland” unfit for agriculture but which drainage had rendered highly productive. Yet, the municipality was unable to change the assessed value and thereby raise needed funds for local road improvement. The Union was also concerned about jurisdictional matters. They requested that any provincial or federal bills affecting railways, or telegraph, telephone, and electric power lines should be vetted by the municipalities which might be affected by them. They requested the right to exempt companies providing work to fifteen or more local employees from paying taxes for up to twelve years, to entice companies to build facilities in Manitoba communities. The Union proposed that all trees and shrubs planted along highways should become the property of the municipality in which they were situated. The meeting concluded with a hearty vote of thanks to the Brandon organizers, after which delegates dispersed around the city. Some went on a tour of the nearby Dominion Experimental Farm  to learn about the latest innovations being developed there. The Macdonald councilors, both of whom were farmers, likely attended that tour so they could take back advice to their neighbors. Then everyone went their separate ways, happy for having played a role in founding an organization that was to become a major force on behalf of municipal governments during the coming century. Union membership grew rapidly in its first half dozen years, leveling off at a little over 100 by 1910. This represented half to three quarters of the municipal governments in the province, depending on the year. The Union organized an annual meeting, usually in Brandon or Winnipeg but occasionally elsewhere—Portage la Prairie, Stonewall, and pre-Unicity St. Boniface. By the early 1920s, these meetings were attended by around 300 people. Their purpose was to highlight common problems, develop collective responses to matters of mutual concern, and pass along useful information. Later, the Union published a magazine, The Western Municipal News, in collaboration with their counterparts in Saskatchewan and Alberta. The Union faltered during the early years of the Great Depression; membership fell for a few years, but the benefits were sufficiently compelling that, as the economy recovered, so too did membership statistics. Over time, the urban municipalities, which had been represented from the outset, drifted away to form their own association. The divorce was temporary, however, for in 1999, the Union of Manitoba Municipalities merged with the Manitoba Association of Urban Municipalities to become the Association of Manitoba Municipalities. The AMM thrives to the present day, having celebrated its 100th anniversary in 2005. 1. Manitoba Free Press, 10 March 1905, page 8. 2. First Annual Report of the Union of Manitoba Municipalities, 1905. Archives of Manitoba. 3. Brandon Weekly Sun, 23 March 1905, page 3. 4. First Annual Report of the Union of Manitoba Municipalities, 1905. Archives of Manitoba. 5. Brandon Weekly Sun, 16 March 1905, page 1. 6. I am grateful to Tom Mitchell at Brandon University’s McKee Archives for drawing my attention to this magazine, and for allowing me to peruse his wonderful collection of the Brandon Daily Sun—the only copies of this paper in existence! 7. Some of the delegates to the founding meeting apparently missed the “photo op” and we are not certain whether J. F. Goldsbrough (the spelling of our surname changed after 1911, for reasons unknown) was among them. I am inclined to think the fellow in the buffalo coat and peasant cap on the right side is him, but my dad is not so sure.